Is Majora’s Mask 3D on the way? After The Legend of Zelda: Ocarina of Time 3D a lot of people expected it to be followed up with a similar remake of Majora’s Mask. What actually happened was that the next Zelda game for 3DS was the brand new A Link Between Worlds which was still a very good game. I’ve just recently finished playing it and I couldn’t help but notice a large number of links and references to Majora’s Mask and so I can’t help but wonder if these are hints as to what they’ll be working on next. Here are all the things I noticed. 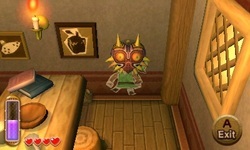 The most obvious one is the fact that Majora’s Mask itself is hanging on the wall in Link’s house. 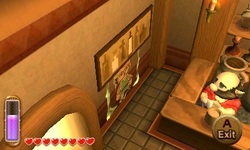 You can even merge into the wall to make it look as if Link is wearing it. In Ocarina of Time there is a farmer named Talon. In Majora’s Mask (which is implied to take place in another universe) most characters from Ocarina of Time have identical counterparts. Talon’s counterpart is a barman who runs a milk bar and A Link Between Worlds features an identical barman in another milk bar. In Majora’s Mask, there is a giant turtle that you ride on the back of to get to one of the game’s dungeons. 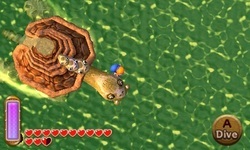 In A Link Between Worlds there is a near identical giant turtle who you also ride to get to one of the dungeons (this time it has a whole family of baby turtles too). One of the biggest features of Majora’s Mask is the fact that there is a very large number of masks to collect. In fact, masks are perhaps the biggest motif of the game. A Link Between Worlds features a cult of people who all wear masks, perhaps an intentional tip of the hat to the earlier mask theme. The most interesting link between A Link Between Worlds and Majora’s Mask is the similarity between Termina (the setting of MM) and Lorule (a setting in ALBW). When you get towards the end of ALBW you discover a lot more about the plot: a long time ago, the people have Lorule had destroyed their version of the Triforce in order to stop it from falling into the wrong hands. Because the Triforce was destroyed, however, Lorule was not safe at all and the whole world began to fall apart. In time, it would have been entirely destroyed. 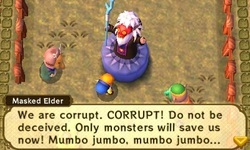 In MM, Termina (a land which, like Lorule, exists in another universe) is due to be destroyed in three days’ time when the moon comes crashing down from space. So, both worlds are doomed (unless Link does something about it) but it’s even more interesting than that. The Triforce almost does not appear at all in MM, the only places it can be found are on Link’s shield (which would originate from Hyrule anyway) and in a dungeon called The Stone Tower Temple. It’s not in a very pleasant place in there either; it’s on the backside of a really ugly statue. So perhaps the people of Termina did away with the Triforce too? Or perhaps, it took a long time for the destruction of the Triforce to have a negative effect? And maybe Termina and Lorule are different kingdoms in the same universe. It’s all just speculation, of course, but I really hope there is a Majora’s Mask remake!